At StimulusBrand, we launch new brands and re-invigorate existing ones. For companies large and small, regional to national. More than ever,, your customers are beoing pulled in mnay directions. How you reach them and how relevant you are is critical. Make sure you stay in their world, stay connected, and stay relevant. 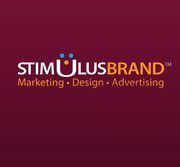 At StimulusBrand, we help re-invent how you reach your customers and engage them to choose your brand. We help define brand positions and create identities, brochures, print ad campaigns, direct mail, websites, television, radio, and video, signage, displays, social media, and more. Our goals are to help distinguish your business in a way that stops, excites, informs, and moves people to action. And, stimulate your bottom line. Rate and review StimulusBrand Communication in Ewing Township, NJ, United States! Share your experiences at StimulusBrand Communication with your friends or discover more Contractors in Ewing Township, NJ, United States. J P Z Construction Co.